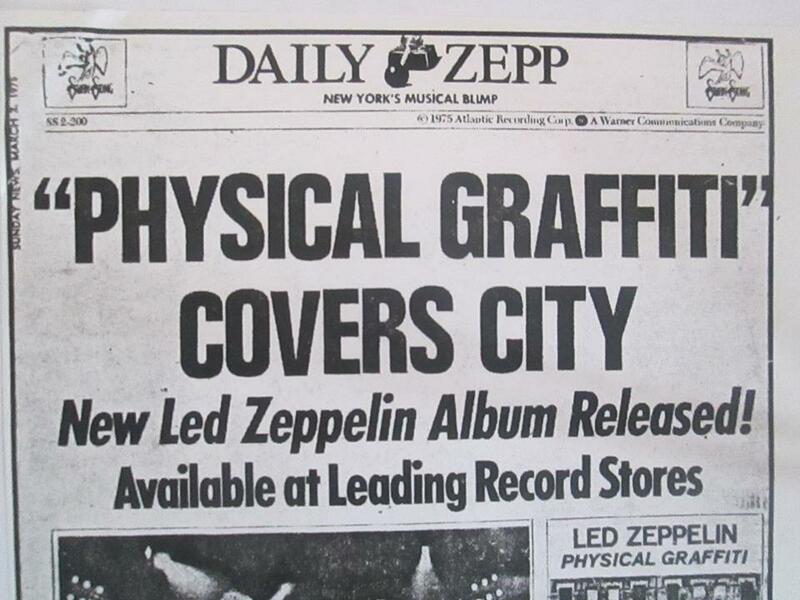 Physical Graffiti Covers City! New Led Zeppelin album released! After all the build-up, it’s now time to celebrate the long awaited release of the reissue of Physical Graffiti…officially released today -40 years on. Wherever you are, however you invest in this massive outpouring – these next few days are going to be pretty monumental for Led Zeppelin fans the world over…I’ll be on my own quest today to get my hands on the product that matters…more on all that soon. To backtrack 40 years: In the scheme of things the timing on the recording of this album was just so right. There was nothing like the pressure they had in following Zep IV with Houses Of The Holy. The lukewarm press reaction to Houses would only spur the four to greater on stage heights. 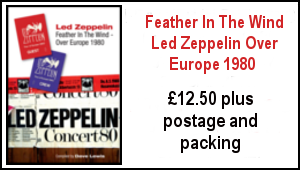 The touring period from March in Europe through to the lengthy US jaunt in the summer of ’73 saw Led Zeppelin perform to overflowing audiences with increasing confidence. There may have been a period of burn out following the US tour – the initial sixth album sessions were scrapped due to John Paul Jones having some issues, but it can be clear that the vigour and vitality they displayed during that US tour was more than in evidence when they came to park Ronnie Lane’s mobile studio outside Headley Grange in early 1974. The decision to work at their own space with no pressure of a tour to prepare was a crucial one. 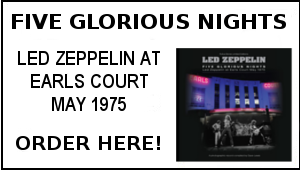 Jimmy’s wry comment that ‘’1974 didn’t really happen’’ was a something of a smokescreen – as creatively, it very much did happen and it would set the seal on a six month period in 1975 that would see them conquer America yet again and present five shows at London’s Earls Court that really did capture them at the peak of their powers. The eight recordings honed at Headley Grange were merged within seven older tracks held over from previous albums. We now know that had been the clear intention with Houses Of The Holy as Page recently revealed: ‘’ It was left off the Houses Of The Holy album on purpose. 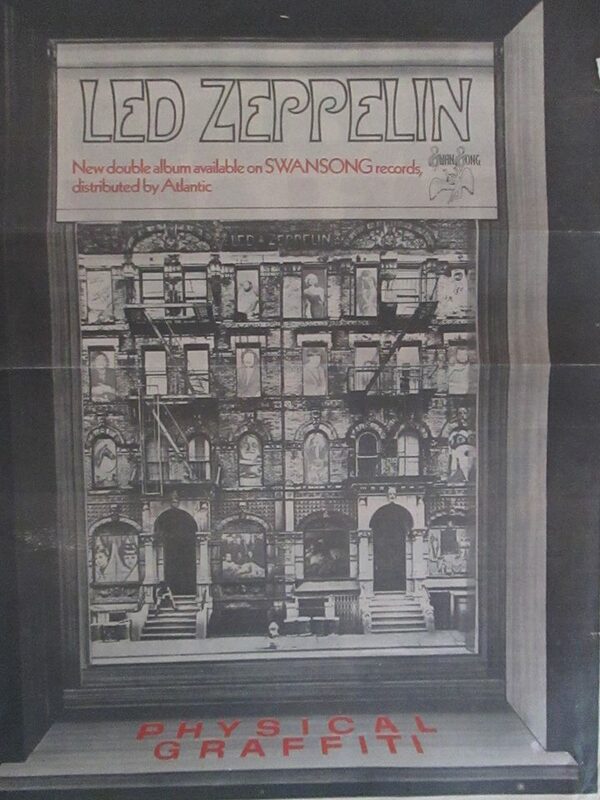 It was saved for whatever the next album was going to be which turned out to be Physical Graffiti’’. 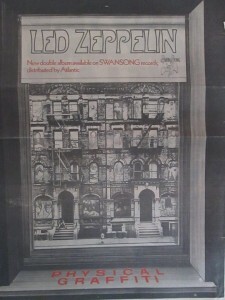 You could just never envisage Physical Graffiti not being played in the sequence that Jimmy Page prepared back in 1974. It’s akin to a whole symphony greater than the sum of its parts – take any song away and it loses it’s thread. So let’s be under no illusion the arrival of this new remastered reissue is principally all about those 15 tracks – the Companion Disc is of course a very welcomed dessert – but the main course kicks right off with track one side with a chew of the Custard Pie and closes some with the brutal last gasp salute of Sick Again. And that my friends, is the way to listen to Physical Graffiti – there’s no cherry picking required. It’s the whole first course in one sitting and no messing. Every facet of the spectrum beautifully detailed – every moment wonderfully sequenced. Dave Lewis February 23, 2015. NO OTHER top band in the world gets as much stick as Led Zeppelin. Every time they bring out an album there’s six months of carping because it’s not full of re-makes of ” Whole Lotta Love “; followed by an¬other six months of moaning because they haven’t played any live dates; finishing up with a final six months of complaints about the time it’s taken them to make the new album. Then, of course, it all starts over again. Not this time, though, I suspect. By allowing themselves the luxury of a double album, they’ve managed to cram in a bit of everything and in enough quantity to keep that vocal minority of moan¬ers at bay. 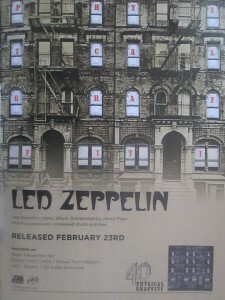 For once they will have to admit that the wait since ” Houses Of The Holy ” has been worthwhile; some may even be moved enough to recognise “Physical Graffiti ” for what it is; a work of genius, a superbly performed mixture of styles and influences that encompasses not only all aspects of Led Zep’s record-ing career so far but also much of rock as a whole. This is not just a collection of great tracks, but a perfectly balanced selection of music that weighs heavy rock with acoustic, ballad with out-and-out rocker in such a way that you can play the album non-stop day and night without ever needing to pause for a bit of peace. And for one of the world’s heaviest bands, that’s some achievement. 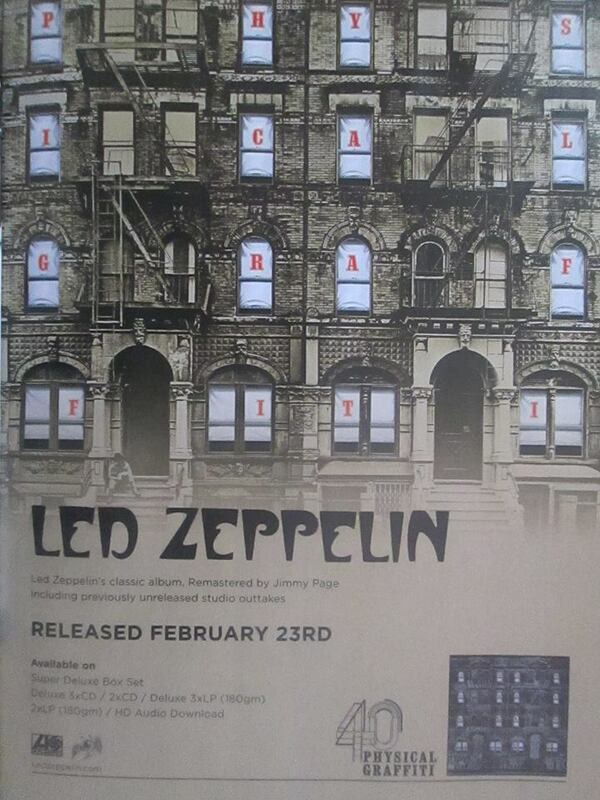 “Physical Graffiti” has not just been “worth the wait”, it had to take a long time to produce music of this calibre. Unlike so many bands today, who hurl out albums like they were frisbees in Hyde Park, Led Zep can be bothered to take the time and trouble to make this one even better than the last one. 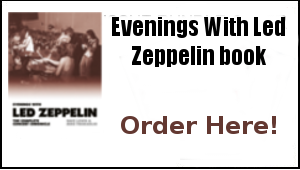 Zeppelin have, and still are doing just that. They estab¬lished their base with heavy blues/rock on “Led Zeppelin 1″, and have constantly sought to build on that, investigating new fields; from the folky “Battle Of Ever¬more” to the reggae in¬fluenced “The Crunge”. Now they’ve taken electronic space rock for “In The Light”, one of the two most immediately striking cuts on “Physical Graffiti”. It opens with eerie keyboards that sound like they belong to the Pink Floyd’s “Set The Controls For The Heart Of The Sun”, before moving on to more familiar Zeppelin riffing. What marks it as the work of true musical craftsmen, though, is the linking: those space sounds are not just a frill tagged on for the hell of it, but .properly joined to the core of the song, first led in by Robert Plant’s voice, then led out for a reprise in the middle by Jimmy Page’s acoustic guitar. “Kashmir”, hits you just as immediately. It’s in a Completely different vein: heavily orchestrated, with a chopping string riff which builds up to a crescendo at the end of each verse. The nearest equivalent is the work of the classical composer Moondog, who uses the same richly- descriptive style. So effectively is it used though on “Kashmir” that it actually sounds like you’re travelling on a caravanserai through the East. And Plant is at his magnificent best, letting his voice be gradually enveloped in the rich orchestral text¬ures and then suddenly soaring through,, like the sun coming out from behind a cloud. Certainly this is one of the most imaginative and out¬standing numbers Led Zeppelin have ever cut. But the band’s strength does not always rest on the new. They take that old, old theme of the blues on “In My Time Of Dying” and came up with a fresh approach, by constantly changing the pace, veering from the breakneck to the dead slow. The song is never fractured: Plant holds a note here, John Bonham continues a drum pattern there, and it joins together as tight as a clam. And if it’s heavy rock you want, Zeppelin can drive a number along like no other band on earth. Listen to them roar through ” Custard Pie”, “Night Flight” and “Sick Again”, always giving that little bit extra that’s the sign of class — a bubbling keyboard here, a nifty riff there, an intricate pattern elsewhere. They can be wistful (“Down By The Seaside”), fun (“Boogie With Stu”), acoustic (“Bron-Yr-Aur”), me¬lodic (“The Rover”) — just about anything in fact. 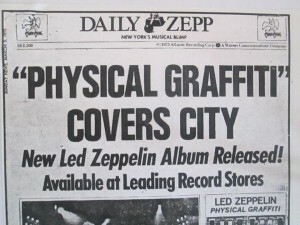 They can take as long as they, like with the next album: “Physical Graffiti” will last 18 months or 18 years. And then some. Postscript 2015…..or 40 years. And then some. Something of a whirlwind few days here which started on Thursday with the Olympic Studios Playback. 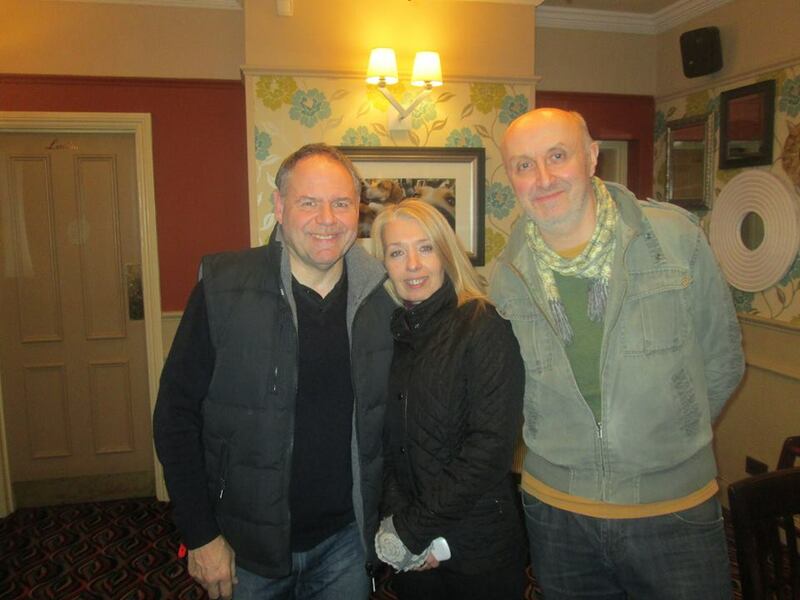 I’ve also had my very good friend Dec staying with us over the weekend – Dec is moving to Ireland next weekend so it was a last chance to catch up with the Bedford crew here. Many a laugh has been had and more than a few pints. The pair of us are heading back to London this morning – Dec to get his packing underway, me to search out that Physical Graffiti product. Here’s the good lady Janet and myself with the soon to be departing Dec. This is the man who secured our Earls Court second row tickets by queuing overnight at Earls Court on March 15 1975 -and has shared many an adventure since. We’ve known each other since we were 17and he is indeed a top man. Good luck mate! 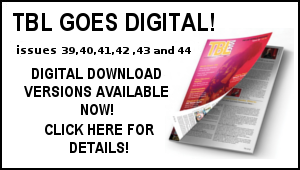 Then it’s back full on with the TBL projects – and of course the tracking of all this amazing Physical Graffiti coverage. In between all the merriment of the weekend, I did manage to record two interviews early on Sunday morning. Just before 6.30 am I did a piece for the BBC Radio Five Live Sunday breakfast show followed half and hour later by another interview to be aired by the News 1130 radio station in Vancouver. Not bad considering I was still in the Three Cups pub in Bedford well after midnight! Phew rock’n’roll…. Ordered my Deluxe CD from Amazon but was not getting delivery until Wednesday. However I realised that the album would be available on Amazon Cloud on Monday night. Well even with this less than lossless version the affect was truly shattering. From the first riff of Custard Pie I was back in 1975. It was like I was listening for the very first time again. The sound was so clear, every instrument so well defined, Plant almost sounded as if he was in the room. I hung onto every note. And that feeling carried on through the rest of the album. Can’t wait for the CDs to arrive. Even the bonus tracks partIcularly Everbody Makes It Through had me completely captivated. This was, for me back in ’75, the first Zeppelin album I had bought and it was a sheer pleasure to lose myself in it again. on the BBC for a change.I am opening my triple vinyl almost 40 years to the day that i opened my double.Things moved so fast then, i never thought i would be looking forward to doing it all again.Amazingly i am more excited this time than the time before! Well, that’s another release day ritual over and done with, mission accomplished. The great thing about HMV Newcastle is that it moved from Northumberland Street into the Eldon Square shopping centre, so I don’t have to wait in the freezing cold for opening time (which fluctuates between 8.30am and 9.00am, depending on the mood of the staff each Monday). It sounds ridiculous, but I am genuinely buzzing when the shutter goes up. No big in store display, but lots of previous Zep releases on show, including the Celebration Day vinyl box. In My Time Of Dying was playing upstairs at opening time, with some tuneless whistling accompaniment from the HMV shop counter bloke. Nice to see the die-cut windows on the CD versions. Can’t wait to hear the remastered Bron-Yr-Aur in all its sparkling glory coming out of my Linn speakers tonight. Re. the next/final batch of reissues circa late June: Can I reserve my promotional obelisk now…?